Here we go again, another controversy courtesy of the far left. The latest target of their disdain for truth, none other than Chick-Fil-A, the famous chain of quick service chicken restaurants. None on earth has fury as a bunch of disgruntled liberals, unable to force their opinion on others. Chick-Fil-A is standing it's ground, as many liberals (ah-hmmm) socialists hurl hate filled epitaphs at the company for maintaining it's view of traditional marriage. It is open season for liberals and gay's to persecute anyone and anything remotely Christian in nature. Liberals hate real Biblical Christianity, and they hate anyone who practices it, and holds it's traditional beliefs. In the case of Chick-Fil-A, all the liberals guns of misinformation and hate are loaded, and firing at will. Have you figured out yet that Christianity, and Socialism are incompatible? The two are diametrically opposed, and cannot exist side by side. Down through the ages people had attempted to eradicate Christianity, and the Bible, the People of God. Many Christians died horrible deaths because of their faith, but the truth of God and His Word continued on. This is because Christianity not just another religion, but it is a real faith that is founded upon a real person, Jesus Christ! There is spiritual power behind this real faith known as Christianity, and you can't fight what you can't see coming. Chick-Fil-A was founded upon Christian principles, and all of it's stores are closed every Sunday, because it is the Lord's Day, and the company encourages their employees to worship in the place of their choice if they wish too. I believe in the end Chick-Fil-A will come out the winner, and only grow stronger. “We studied everything we could from the historical, political, economic, and cultural perspective. At first, we thought it was because you had more powerful guns than we had. Then we thought it was because you had the best political system. Next we focused on your economic system. But in the past twenty years, we have realized that the heart of your culture is your religion: Christianity. That is why the West is so powerful. 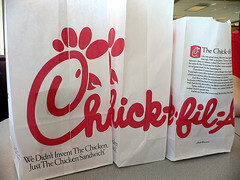 Shut your mouths and leave Chick-Fil-A alone, and other Christian businesses alone! You stupid liberal politicians who want to ban Chick-Fil-A from your cities because they will not bow to the idol of gayness, Get over yourselves! You cannot stop a company from opening a business in your town, it's a free country, and we have a free market society, so chill out! You colleges and universities that want to drive Chick-Fil-A from your campuses because they will not march in lock step too your Communist drum beat, Get a Life for yourselves! Let's put it this way. We out here in the real world can stop writing checks too your institutions, and we can vote against stand in the way of you getting any of our tax dollars to fund your ridiculous agendas. TELL THE LIBERALS TO STUFF IT, AND EAT MORE CHICK-FIL-A! Is Freedom of Speech a One-Way Street?